John Carpenter’s Halloween. 1978. Directed by John Carpenter. Screenplay by John Carpenter & Debra Hill. Starring Donald Pleasence, Jamie Lee Curtis, P.J. Soles and Nancy Loomis. With John Carpenter’s masterpiece of slasher horror, Halloween, there’s really not much more I can say about it that hasn’t been said. Maybe someone, some day, will come out and say new, innovative things about this classic horror nobody has ever thought of saying. Maybe, though, I doubt it very much. But that’s not to say that we can’t appreciate it. Furthermore, we can continue to appreciate it more and more by hearing how others react to it. That’s honestly one of my favourite things about cinema and the film experience in general: seeing the way other people feel about it. For instance, the way I get scared or creeped out by a movie is not necessarily the same as the next person, or perhaps anyone else. Filmgoing is a unique and personal experience. While some movies thrive off that group experience, most movies you’re going to see have a quality about them which makes you want to look inward, if you think about it hard enough. A lot of people might look at Halloween and think it’s simply Michael Myers, the mental ill little boy who hacked up his sister on the night that’s meant to be fun and games and candy, stalking down teenagers and killing them in the night, terrorizing the whole fictional town of Haddonfield. Is that all the movie can be? Not at all. There are different reasons people find the movie scary, so what I’d like to do with this review is ignore talking too much about the actual plot, and more so I would like to bring attention to the bits which truly got me, the scariest moments, the best technical pieces, and why Halloween continues to last in our collective horror movie memories as a classic – one that continues to inspire, even 37 years after the fact. One of the great bits on the Blu ray is that John Carpenter does an incredibly thorough commentary, which also includes the ever wonderful Debra Hill (R.I.P) and the original Scream Queen herself, Jamie Lee Curtis. We get everything from moments where Hill talks about the budget and how they were able to execute certain scenes, shots, et cetera, to bits with Carpenter where he discusses the music, the cinematography, the script, character, and even a few jabs at the silliness of believing movies and television and games warp our minds; his sly comments are always the best. Carpenter is one of those strong auteurs in the horror genre. He’s made a couple movies I don’t particularly find that great, but honestly he has made so many great pieces of film I can forgive him a DOZEN bad ones (though he only has a couple – nowhere near a dozen). To hear some of his opinions while watching Halloween is truly good stuff. We also get a window into Carpenter’s mind, in the sense of what he finds creepy, what scares him and how he tries to make his own films scary. The reason I love him so much, and why Halloween is such pure dread at times, is because Carpenter knows exactly how to build up suspense and tension. If you’ve read any of my reviews, which you’ve probably not, you’ll know that suspense and tension is what I find actually builds up a horror to where it ought to be in order to actually, genuinely scare people; without resorting to a ton of jump scares. Another reason I find this movie so creepy and particularly enduring is because it does not go for a bunch of those, instead Carpenter uses the cinematography, the music, and he builds things up slowly. This movie has a dreadful air about it, which makes you feel like anything could happen, at any time. 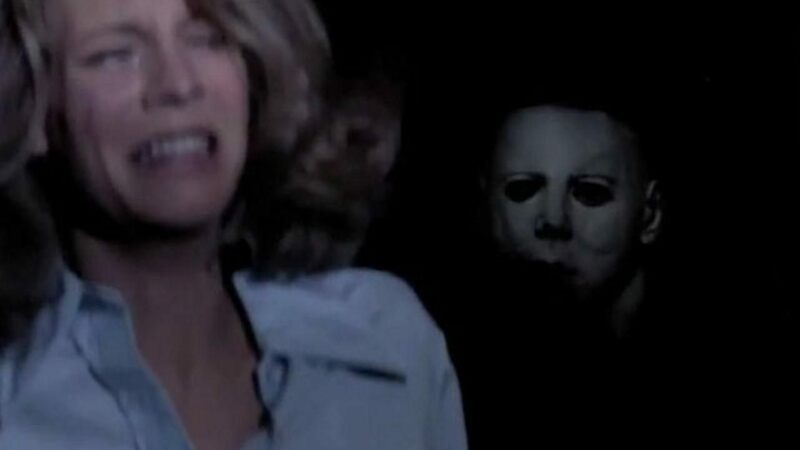 So many times we watch Michael Myers creep around in the back of shots. There are actually moments that, if you don’t keep an eye on the shot, you could miss Michael in the background. While there are jumpy moments, they’re not as jarring as some modern horror we see these days, essentially relying solely on sudden movement to spook people. Here, Carpenter makes us jump slightly, however, it’s what happens directly afterwards that makes you get really creeped out. Jamie Lee Curtis, in the commentary, brings up an amazing point I always loved, which everyone has certainly noticed time and time again – when Michael pins Lynda’s (P.J. Soles) boyfriend to the wall and steps back, he tilts his head, as Curtis points out, just like a dog. This is one of the moments you realize Myers is human, but he’s not quite fully human. He has animalistic, primitive qualities, aside from the fact he’s a total mute. And there are a bunch of moments happening like this. Another excellent scene is when Michael goes back up to the room where Lynda (Soles) is, and he has the blank sheet ghost costume on, with her boyfriend’s glasses over top. Like Carpenter says in his commentary, the scene takes its time to build. We know that it’s The Shape/Michael underneath the sheet, while Lynda does not, and it’s like that old Alfred Hitchcock idea: show them the bomb, then let the audience sweat out the results. As the time goes on, things get more and more tense, until finally Lynda is dispatched by Michael. He picks up the phone and just listens, something I found super creepy. He’s frozen in that primitive child-like stage from when he first committed murder at such a young age. Bits of the Myers character come out from a role that’s played with no spoken words at all. Pretty impressive to me, not sure if that was all scripted or if some of that came out on-set as Carpenter had the cameras rolling. Once the terror kicks in full gear, the most genuinely frightening bit for Father Gore is when Jamie Lee Curtis is trapped in the closet, curled up in the corner, and Michael is beating his way in through the folding doors, the light is swinging around and his hand is smashing through – just a genius bit of horror that always gets my heart rate pumping! After Michael goes down a little later, then in the back of a shot as Jamie Lee Curtis tries to regain her composure he rises up and looks over ever-so-slightly, I’m absolutely floored, each time I see it. Creepy as all hell. Something that helps Halloween is Carpenter and Hill didn’t go for a teenage bloodbath, as so many of the films which came after it, attempting to emulate its success, ended up doing. In opposition, Carpenter and Hill focused more on building up that suspense, scene after scene, and making the characters feel believable instead of a bunch of young people who nobody cares about and consequently nobody gets too frightened when they’re killed. There’s a tiny bit of blood in this movie, other than that – virtually nothing at all. Every bit of horror we get comes from creepiness that extends out of all that slow building Carpenter goes for with the tracking shots via Steadicam, the quiet bits of Myers lurking in the back of shots, and so on. If Carpenter instead tried to make everything bloody, pumping the gore into each kill, that would’ve taken away from the important aspects which actually frightened me. Blood doesn’t equate to a good horror movie. Finally, I’ve got to mention the music. I mean – how can you not? The fact John Carpenter is so excellent at writing his own little pieces of score makes him that much more of an auteur. Who doesn’t recognize the iconic Halloween theme? I don’t know if there’s anyone over the age of 25 who doesn’t. Even before I’d actually seen it at twelve-years old, I knew the theme from pop culture. So to think Carpenter crafted every little piece of this film to his liking, it always strikes me as one of those genuine horror masterpieces. Everything in this movie has Carpenter over it; though many people were involved, his fingerprints and DNA are inside this and you can tell by watching other bits of his work. There’s something amazing about this movie because it’s not simply Halloween – it truly, truly is John Carpenter’s Halloween. Something which will always set it apart from the pack of horror movies out of the 1970s, and even everything after. One of the greatest horror films ever made. Also cannot forget – to have Donald Pleasence in this film is a true stroke of genius on the part of Carpenter. One of the most iconic rivalries in all of horror is that between Myers and Dr. Loomis. The way Pleasence plays the role is absolutely perfect, I don’t know if anyone else could’ve brought what he does to the part. There’s a craziness to him, but also this cold, sane rationality. May actually be my favourite performance of any horror just because of Pleasence’s performance; the character isn’t even that developed, other than his connection with Myers as psychiatrist, however, Pleasence brings a special something that makes this man feel full, real, and very intriguing. He’s definitely seen a lot, knows even more, not to mention he’s a stark opponent of evil. Ultimately what makes Halloween so enduring – almost 40 years now since its release – is the fact that, while it is horror, one of the earlier slashers (not the earliest as some claim but close), John Carpenter crafted a really beautifully filmed, expertly suspenseful piece of work. The character Jamie Lee Curtis plays is also so relatable, with the angle of babysitting and such a quiet, middle-class neighbourhood, and it helps lull people into a sense of security like the way in which she sees the world. Then, once Carpenter is done building and building on all of what he calls his “maximum dread”, the finale of film breaks out and brings the terror. Such incredibly executed techniques on Carpenter’s behalf. Another shot I love is when Jamie Lee Curtis stumbles back into a corner, then we see Myers’ mask slowly appear out of the darkness. SO INCREDIBLY UNSETTLING! Subtle and terrifying all at the same time. To have a horror film pay attention to the technical elements, to try and go for genuine horror/scares, it makes things worthwhile. There’s nothing worse than seeing too much attention paid to the wrong aspects, in the end rendering a movie useless in the horror department. Instead, Carpenter pulled out all the stops, even on a film that’s budget was only about $300K. He made sure there was tension, like a good helping of Hitchcock mixed in with the stuff of pure nightmares. Added to all that, Carpenter busts out a creepy score that adds an extra dimension of terror. I can’t express my love for this film enough. The Blu ray is fantastic. I’ve watched it about a dozen or more times; before that, I had the DVD, before that it was VHS. So who knows how many times I’ve seen Halloween, in the end it doesn’t really matter. Dig it, or don’t dig it. I will always tout this as one of the best horrors on film, which it will continue to be until I die. Thanks for the comment, Dougie! Glad you enjoyed the article, and the site, too. I actually only recently saw the Absolute Evil mockumentary, and loved it. Anything interesting Halloween-related, I dig. I’m really interested in the Carpenter-approved film they have slated with David Gordon Green and Danny McBride; seems like an odd pair, though I’m excited for some fresh blood to take hold of the franchise, of course with Carpenter’s approval it’s even better. But yeah, the movie is one of those that will ALWAYS chill me. No matter how many times I watch it, there are moments too good to forget.